GENEVA, Nov 8 2013 (IPS) - Raising expectations for a deal over its controversial nuclear programme, Iran’s chief negotiator Mohammad Javad Zarif has said that a joint statement on the framework of a nuclear deal could be issued as early as Friday here amid ongoing negotiations with the P5+1 group of world powers. Those expectations have also been raised by an NBC report that U.S. Secretary of State John Kerry — who President Barack Obama appointed to oversee the U.S. side of nuclear negotiations with Iran in September — is unexpectedly heading to Geneva now. While officials from all sides here have remained tight-lipped about what that deal could include, the Iranian foreign minister exclusively told IPS that Iran’s parliament could consider implementing the Additional Protocol — a voluntary legal agreement that would allow the International Atomic Energy Agency (IAEA) increased inspection access to all of Iran’s nuclear facilities — as part of a deal if it was convinced that sanctions would be reversed. “The additional protocol is [only] within the prerogative of the Iranian parliament to adopt and to ratify, but we can consider it if the necessary confidence is built,” Zarif told IPS in an interview Thursday evening. “[The U.S.] should show that they are prepared to reverse the trend; that is, to stop trying to achieve their objections through pressure on Iran,” said the foreign minister. “Iran demands respect and equal footing [that is] only done when you are prepared to accommodate the other side without trying to impose your views,” continued Zarif. “We want to see a situation where Iran’s right to the peaceful use of nuclear energy, including enrichment on Iranian territory, is respected and at the same time all sanctions are removed,” he said. “We are prepared to address the concerns of the international community in the process,” he added. Asked by IPS to elaborate on any impediments to a deal, Zarif said that Iran was seeking one that was domestically acceptable. “For this deal to be sustainable and in fact foster confidence, it needs to be balanced,” said Zarif, a Western-educated academic who worked closely with the U.S. in 2001 in drafting the deal that led to the post-Taliban government in Afghanistan. “Neither side should be told at home or by detractors outside that they’ve been taken for a ride; you want a deal that can be presented to sceptical publics,” he said. Zarif also rejected the possibility of Iran suspending its controversial uranium enrichment as part of the framework of a possible deal. On Wednesday, that idea was expressed by the U.S. Senator Robert Menendez, the chair of the Senate Foreign Relations Committee, in an interview with CNN. Menendez told the journalist Christiane Amanpour that Iran should completely “suspend” its nuclear programme before even a pause in more sanctions. Zarif rejected that notion this evening in a follow-up CNN interview and with IPS. “From 2003-05 we did in fact suspend [uranium enrichment]; it didn’t lead anywhere,” Zarif told IPS. “And from 2005 until now, they’ve been pushing for suspension. 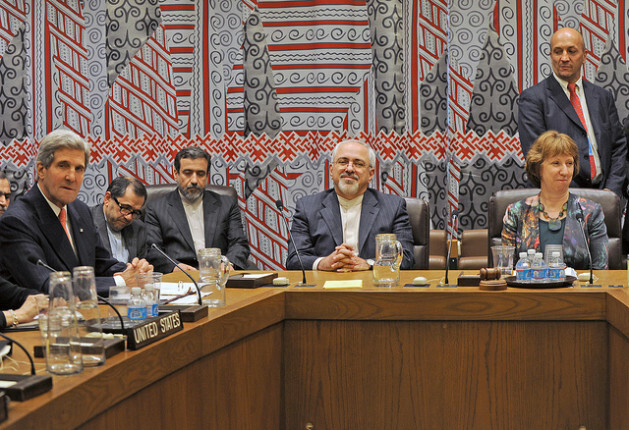 The result is that in 2005 we had less than 160 centrifuges spinning, now we have 19,000,” said Zarif. Iran could address those concerns by operating its nuclear programme in a “transparent, open way with IAEA monitoring,” he said. Although the Obama administration has recently been lobbying for a temporary pause in the implementation of more sanctions on Iran while talks are in progress, key figures in Congress are voicing resistance against the effort. “In response to a first step agreed to by Iran that halts their programme from advancing further, we are prepared to offer limited, targeted, and reversible sanctions relief,” said the official, who was speaking on the condition of anonymity. But the Senate Banking Committee is reportedly now poised to move ahead with more sanctions on Iran after the talks conclude here on Nov. 8, according to Reuters. On Wednesday, a top Republican senator on the Foreign Relations Committee also said he was preparing legislation that would prevent the loosening of sanctions on Iran. “We’ve crafted an amendment to freeze the administration in and make it so they are unable to reduce the sanctions unless certain things occur,” Sen. Bob Corker told the Daily Beast on Wednesday. While Iran may currently be far from reaching relief from U.S.-led sanctions targeting its oil revenues and banking sector, it may be getting closer to obtaining relief in other ways as part of a mutual deal. “A lot of the U.S. restrictions are going to remain, but a good deal that the administration here signs off on could have a big impact on sanctions relief,” Suzanne Maloney, a former State Department policy planning official, told IPS. “It depends what happens over the course of the next 24 hours…it’s difficult to persuade Congress to back off on any kind of pressure on Iran, but the banking committee’s decision doesn’t mean these provisions automatically become law,” said Maloney, an Iran expert at the Brookings Institution. “It’s entirely conceivable that if we see something come out of these talks, these sanctions would either not become law or be implemented,” she said.